이 책은 고려 조계산 수선사(修禪社) 제 6세주(世主)인 원감국사(圓鑑國師) 충지(冲止, 1226-1292)의 저술이다. 그의 저술로는 문헌비고에 『원감국사어록(圓鑑國師語錄)』과 『원감국사집(圓鑑國師集)』이 있었다고 하지만 현재 『원감국사가송(圓鑑國師歌頌)』과『해동조계복암화상잡저(海東曹溪宓庵和尙雜著)』가 전하고 있다. 판본은 고려말에 판각된 책판(冊版)에서 찍은 후쇄본(後刷本)일 것으로 추정하는 견해도 있으나『원감국사가송(圓鑑國師歌頌)』과 함께 판각된 조선조 초기인 세종 29년(1447)의 판본으로 추정된다. 고려시대 수선사 제 6세 국사인 원감국사 충지의 문집 중에 잡저(雜著)만을 간행(刊行)한 현전하는 유일본이란 점에서 불교학 및 서지학 연구에 귀중한 자료이다. This book contains miscellaneous writings of Chungji Wongam (1226-1292), the sixth State Preceptor of Suseonsa Temple at Jogyesan Mountain during the Goryeo Dynasty. Munheonbigo (Encyclopedia of the Joseon Dynasty) lists some of his other literary works, including Wongamguksa eorok (Sermons by State Preceptor Wongam) and Wongamguksajip (Collections of State Preceptor Wongam). However, only Wongamguksa gasong (Poems by State Preceptor Wongam) and this particular book, Miscellaneous Writings of Buddhist Monk Bogam of the Jogye Order of Korean Buddhism, remain today. 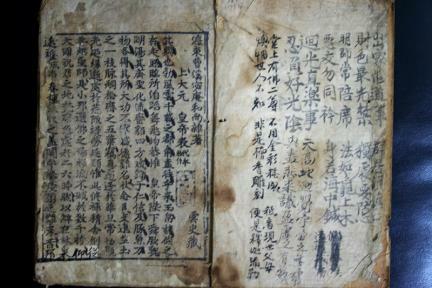 Some scholars believe that this book was a later edition printed from woodblocks engraved in the late Goryeo Dynasty. However, it is presumed that the book was printed from woodblocks that were engraved in 1447 (the 29th year of the reign of King Sejong of the early Joseon Dynasty) together with Wongamguksa gasong. This book is an invaluable material for the study of Buddhism and bibliography as it is the only extant wooden print of the miscellaneous writings of State Preceptor Chungji Wongam.